1. 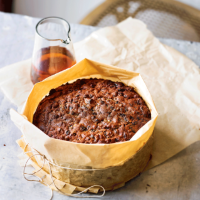 The day before baking your cake, mix all the dried fruits and mixed peel together in a large bowl and pour over the brandy, orange zest and juice. Place in the fridge overnight to soak in. 2. Preheat the oven to 150°C, gas mark 2 and line a round 23cm loose-bottomed cake tin with a double layer of baking parchment, allowing a few centimetres to stick out at the top. 3. Beat together the butter and dark brown sugar by hand or in a stand mixer until light and fluffy. Crack in the eggs one at a time, beating well after each addition. Beat in the milk. 4. Once combined, add in the flour, baking powder, cinnamon, ground almonds and chopped nuts then mix until just combined. Stir in the presoaked fruit and any soaking liquid and mix until all the fruit is well incorporated. 5. Spoon the mixture into the lined cake tin. Smooth the top with a spatula. Bake for 2 hours 45 minutes, rotating halfway through the cooking time to ensure an even bake and covering it with foil if it looks too dark. Test to see if the cake is baked by inserting a skewer into the centre. A few crumbs should stick to it, but no raw mixture should be present. 6. Allow the cake to cool completely in the tin, before turning out, piercing it all over with a skewer and feeding with brandy. Wrap tightly in parchment and foil and leave in a cool dark place, feeding every few weeks, until ready to decorate.